As of tomorrow, I am 30 weeks pregnant. 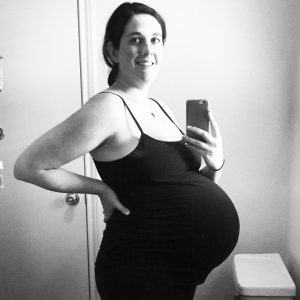 When I found out I was having twins, and I began reading about how half of twin pregnancies end by 36 weeks, I made a 3-page to do list and set a date by which I hoped to complete our biggest preparations: 30 weeks. This list included purchasing a van to fit our whole family and at least owning two car seats, whether or not they were installed. It included having our baby shower so we could purchase the items we still needed. Not on the list, but inscribed into each line, was the goal that, by 30 weeks, I would be mentally prepared to have twins. Well, folks. I confess: I am not ready to have twins. I still don’t really want twins at all. Which is not to say that I don’t want each of the two little girls gestating in my body. I want them both. I want to hold them and fall in love with them. I want to be their mother. But I don’t want to be a mom of twins. And I don’t think I will ever be ready for their birth, for the early weeks of their lives and all the upheaval they will bring, or for the ways my relationships with my husband and son will change through that time. I wrote extensively about the ambiguity I felt as a new mom in my chapbook, which will be published around the same time these girls are born, and it all feels kind of fitting. I struggled back then. In some ways I am now more prepared than I was with my son, but in so many ways, I might as well be starting from scratch. I don’t yet have experience soothing two babies at once, wearing two babies at once, dividing my focus from baby to baby to toddler, tandem breastfeeding, going in public as a three-ring circus. I don’t know how to be whatever it is I will be. I guess I didn’t know how to be a mom before I was one either. The biggest obstacle to me accepting and relishing my role as a mother was how my reality didn’t quite match my expectations. I’d had visions of some other kind of experience than the one I lived every day. It left me with the constant sense that something, or everything, was just not right. It took me a long time to see that, when I saw my life for what it was, and I dealt with it as it was instead of how it should have been, I could finally accept it (all of it, good and bad) and work with it. That lesson applies here, too, though I am trying, and I am struggling. I’ve been getting hung up on every little thing, all the choices I don’t get to make, all the extra expenses, everything I feel I can’t control. But the root of it all is that I didn’t choose the main thing. I didn’t choose to have twins. I thought I’d be over that by now. 30 weeks seems like a long enough time. Apparently I will just have to keep working at it. I imagine I will have to keep working at it in various ways well after they are born. Until late last night, this thought really scared me. It made me think I was destined for depression again and that I would morph into a terrible mother. Now I just think, That’s okay. It takes whatever it takes. I didn’t tell my son I loved him until he was three months old, and I am madly in love with him now. Sometimes, we just have to find our own way in. Although I can’t see it now, I trust that I’ll find my way into this one, too. Finding your own way in…I love this!